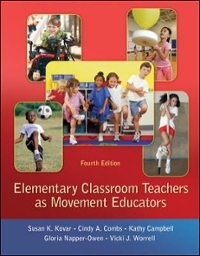 Elementary Classroom Teachers as Movement Educators 4 Edition Physical activity does not start and end in the gymnasium during the school day. It happens all around, every day to make the best lifelong learners. Elementary Classroom Teachers as Movement Educators discusses how teachers can incorporate movement into their daily lessons to help students better learn and engage in a healthy lifestyle.This updated fourth edition continues to cover the traditional physical education content including motor learning and development, exercise physiology, curriculum, safety, and pedagogy in an in-depth way that is meaningful to the classroom teacher. In addition, the book emphasizes motivating children to be active, teaching activity to children with special needs, and integrating subject content and physical activity in the classroom.